This is a classic Lycoming document with a few added notes at the bottom. Note the temperature scale at the upper left. It is certainly possible to lower CHT by adding fuel. The question is "Where are you starting from?" If it's to the left of the best power gray stripe when full rich, it's way too lean. If it's already to the right of the stripe, more rich just means you can't make rated power. Gas temperatures. F/Fc is variation from stoich, aka "equivalence ratio". Note how gas temperature drives CHT. And here's the basis behind the test, previous post. Note that although the absolute numbers change (peak 1600 vs 1540, for example), the delta between peak EGT and the EGT for any given FA ratio does not. Last edited by DanH : 09-21-2018 at 09:36 AM. Gather basic EGT data. Climb to 3500 or so, and allow CHT to settle to a cruise value, which I assume to be well under 400. Now lean to a stable peak EGT on the cylinder of your choice. Record the value. Push mixture to full rich, again allow EGT to settle, and record the value. Report back. Thanks Dan. If the weather behaves I should be able to gather this data tomorrow. I was speaking with another builder here that suffered the same issue. Lower than "expected" flow on takeoff and 420+ CHT in the climb. He too thought he would have to get the servo recalibrated, but after 5 hours of operation, he noticed a significant drop in the CHT, to the point it no longer passes 400degF in climb, so he never adjusted the servo and is now happy with its operation. I'll report back shortly with data. BTW Tom, note the "detonation onset" black tic marks on those plots. They are located on the rich side of peak, between best power and peak EGT. 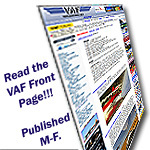 Most engines make maximum power on mixture leaned to just a little short of detonation. You can see it on the 2700/28" plot. On the 2450/24" plot here, detonation onset move closer to peak. The commonly quoted figure for high risk is 50 ROP, pretty much the case with this IO-540 test engine. Look scary? Remember, (1) this test engine (IO540K) is considered to be among the most detonation prone in the Lycoming fleet, and (2) the dyno operator is purposely running the subject cylinder at max CHT (475F), 100+F inlet air temp, max oil temp, etc. The point to remember is that (hopefully) nobody is dumb enough to run it like that when airborne. Still, you have a hot cylinder problem, and you're worried about detonation. To do the mixture test, a fella might not want to slowly lean through the pro-detonation range to find peak. I think the risk is very low given stock compression and ignition timing, but what about the guy with high CR pistons or jacked up timing? How to find peak and feel comfortable while doing it? No problem. After settling in at the test altitude, pull the mixture until it is obviously way past peak. It should run fine there, maybe a little rough if nozzle balance ("GAMI spread") hasn't been tweaked on a new airplane. There is little chance of detonation on the lean side of peak EGT at 2400/24". After temperatures settle, find peak from the lean side by enriching very slowly. You can sneak up on peak without risk. Last edited by DanH : 09-18-2018 at 08:47 AM. Righto Dan, here's the data. I first ran some cruise runs at the above engine settings, resulting in 162KTAS at 11.1gph. CHT's were in the 360degF range. EGT's ranged from 1245 to 1280degF. I did the big mixture pull, then started slowly enrichening to approach the peak EGT. Cylinder 1,2 and 3 peaked at almost the same time at 1460, 1430 and 1440degF respectively. I continued enrichening and cylinder 4 peaked about 10 seconds later and 0.1GPH more at 1450degF. 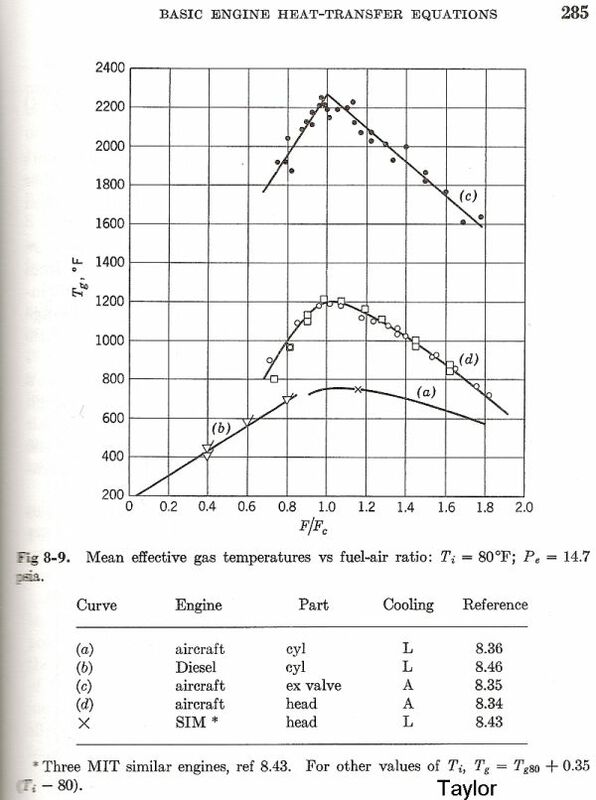 In that time period, the other cylinders had dropped 5degF. The difference between the full rich EGT and the peak EGT for cylinders 1, 2, 3 and 4 were 180, 180, 195 and 180degF respectively. The fuel flow at peak EGT was 8.8gph, giving a speed of 163KTAS. The takeoff CHT's were much better this time. There were a number of contributions to this including the few "waves" that I rectified in the baffles, a reduced climb angle, being faster to set climb RPM after takeoff, and the 6degF reduction in ambient temperature compared to my first session. I only once reached 421degF, and if kept my finger on the pulse, I could keep the CHT below 400 on climbout. I'm getting the feeling that things are moving in the right direction and I won't need to pull that servo afterall. Last edited by tgmillso : 09-16-2018 at 06:51 AM. The difference between the full rich EGT and the peak EGT for cylinders 1, 2, 3 and 4 were 180, 180, 195 and 180degF respectively. Spend your effort working on baffling and sealing. Thanks Dan for pulling together all this info for me. So it's Ops normal by the sound of things. This may be a little thread drift, but I'm also presuming that by a CHT spread this tight (between 0.1 and 0.2GPH, as the resolution is limited to 0.1GPH increments), there's no point in adjusting injector restrictor sizes? Keep in mind that this is at partial throttle settings (2800' density altitude 24" square). The weather looks good to be back in the air for some testing on Wednesday where I hope to better validate the data and perform some sustained climbs to 8,000' where I can gather some wide open throttle data. This may be a little thread drift, but I'm also presuming that by a CHT spread this tight (between 0.1 and 0.2GPH, as the resolution is limited to 0.1GPH increments), there's no point in adjusting injector restrictor sizes? That's a nice tight spread. Do the same check at 8000 or where ever you like to cruise, and if the spread remains that tight, leave the restrictors alone. Note that all mixture checks should be done with verrrrry slow knob movement, or in 0.1 GPH increments with pauses to allow EGTs to stabilize before moving to the next increment. Do a liftoff at full throttle, full rich, and note EGTs immediately after liftoff. Are they the same as the previously recorded full rich values (1280, 1250, 1245, 1270), or slightly less? Last edited by DanH : 09-17-2018 at 08:04 AM. Slightly more. The following data sample is pretty consistent with my other takeoffs and was recorded with an OAT of 55degF at 400ft density altitude. The first row of the data is immediately after liftoff, with a 1325-1350degF range, then it continues to climb for the next 20 seconds or so to 1335-1390degF, even after I have pulled the power back. It peaks at this point, then starts dropping as I continue to climb and steadies out in the cruise at that 1250degF average. Looking at the fuel flow chart below however, the full power peak power fuel consumption should be 14.5GPH (87PPH) but I am running at 15.1-15.2GPH, so I have a .6 to .7GPH margin, which should put me on the rich of the danger zone. I'm guessing the only way to validate this is to do another lean test at 2700RPM and full throttle down low? Sorry, brain fart, meant to ask slightly more, not less; returning to the examples (post 41), again note the absolute EGT values change, but the relationship between delta-from-peak and mixture remains consistent. Put another way, the whole scale moves upward with higher power production. The following data sample is pretty consistent with my other takeoffs and was recorded with an OAT of 55degF at 400ft density altitude. The first row of the data is immediately after liftoff, with a 1325-1350degF range, then it continues to climb for the next 20 seconds or so to 1335-1390degF, even after I have pulled the power back. It peaks at this point, then starts dropping as I continue to climb and steadies out in the cruise at that 1250degF average. The rise for WOT in the posted examples was about 60F. Your initial rise is more like 80, which is fine, and rises a bit more given a bit more MP. Fuel flow mirrors MP reduction in the late entries, so perhaps you unloaded the prop a little with a push to higher airspeed? BTW, what are the time intervals here? 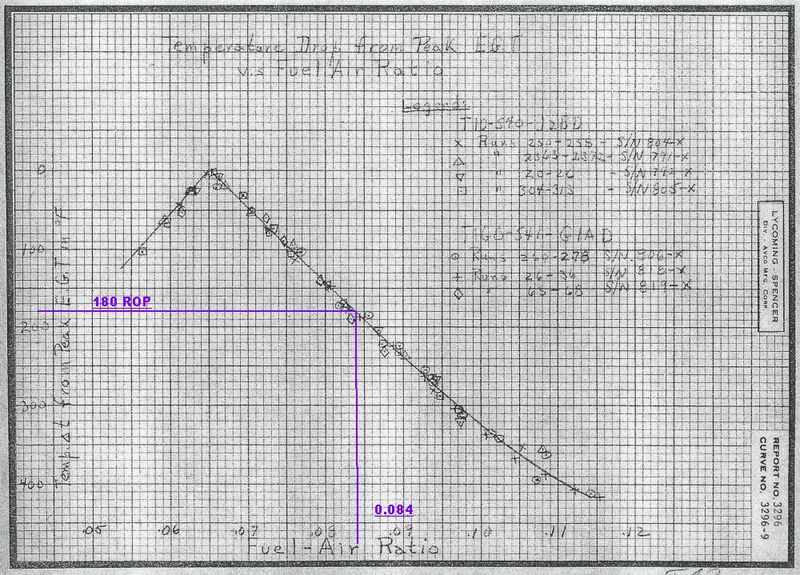 Looking at the fuel flow chart below however, the full power peak power fuel consumption should be 14.5GPH (87PPH) but I am running at 15.1-15.2GPH, so I have a .6 to .7GPH margin, which should put me on the rich of the danger zone. I'm guessing the only way to validate this is to do another lean test at 2700RPM and full throttle down low? Not recommended. I might do such a test, but I can maintain much lower CHT at full power. Bad idea given high CHT, with low value given other indications. Work on sealing and baffling. I should note that your reported EGT delta suggests you're at the lean end of the certification range, which Don Rivera has previously reported as equating to 185 ~ 230 ROP. 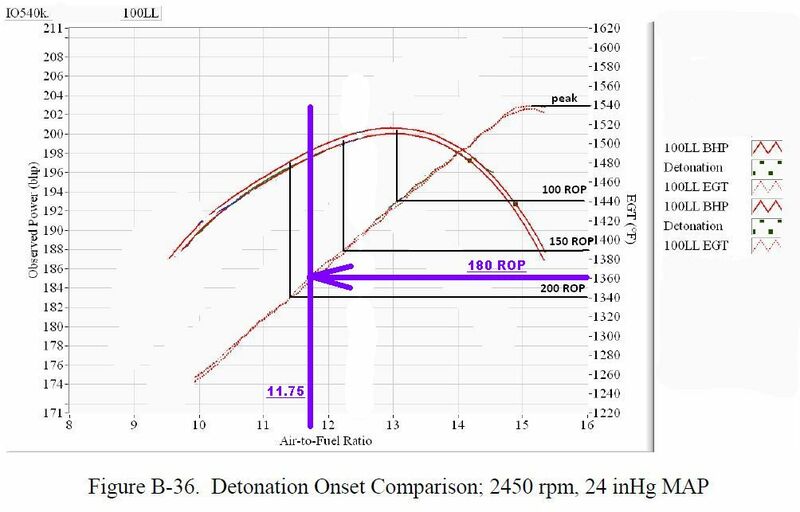 The fuel flow for certification is based on the worst case operating conditions of the detonation survey...plenty of margin with everything very hot. That's not quite the same as a practical range where performance is of more interest. Sending the servo to Avstar for enriching remains an option, and like all else in EAB, your call. Again, I'd make a data-driven decision. Go back and look at the Lycoming leaning relationships chart. It says a change from 180 ROP to 230 ROP would move CHT about 5C, or 9F....not much in return for reduced power and increased fuel cost. Cooling air is free and clean. You pick. The key here is that you are no longer guessing. Thanks Dan. They are 1 second data samples pulled out of the G3X. I did some sustained climb testing today. If I hold it at 130ktas in the climb passing through 5000' I'm getting CHT's in the 378-362degF range and still managing an 1,100fpm climb rate, which I'm pretty happy with (2 POB and near full fuel). Admittedly this was with an OAT of 34degF, but in the defense of the engine, it's still running on break-in oil and only has 4hrs on it including the hour in the test cell. If I bring the climb speed back to 120ktas, I can do a sustained climb at less than 400degF. I took it up to 8300ft and ran some leaning tests again. WOT 21.9"MP 2300rpm, 8500' pressure altitude (7700' density altitude due to the -8degC OAT) I did the big mixture pull then richened to peak EGT and was seeing 7.9GPH at 164ktas, and CHT in the 340-350degF range with EGT's in the 1365-1390degF range. The power readout from the G3X said 65%, but I've been told to take this with a grain of salt. Either way, if I interpolate between the published 55% and 75%, this puts me smack on the Van's speed numbers, which I'm pretty happy with, just with a 0.4GPH less fuel flow based on the Lycoming charts, which I suspect is due to the PMAG's variable timing doing their thing. Looking at the data, as I was enriching the mixture, I see a sweet point at around 20degF LOP, where there is no sacrifice in speed, but a further saving of around 0.3GPH. In light of everything we have covered in the past few days, I'm going to leave things as they are at least until I've got another 10 hours or so on the engine. I've still got that card up my sleeve of putting an outlet ramp on the firewall flange to clean up the exit air if I need it, but elsewhere on the baffles I'm struggling to improve things further. I took it to a maintenance shop here today on my test trip, and had the boss look at the baffles and he couldn't see how I could improve them further and told me to just keep breaking in the engine before I did anything crazy. That said, my oil temps are running on the cool side of normal (160-175degF) so I'm thinking about taping off some of the cooler to force more air through the cylinder head fins instead. Good times. I think I've learnt more about operating air cooled engines in the past week than I have in the previous 20 years. Thanks again for your help.